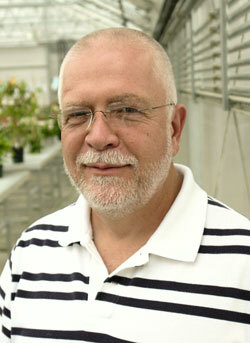 Rick Grazzini, PhD, is executive director of GardenGenetics. He is a plant breeder, and has spent the past 17 years of his career providing contract research services to the chemical and pharmaceutical industries, first as director of business development for Centre Analytical Laboratories, then as president of Exygen Research (created when he and a partner acquired Centre Analytical). Exygen Research was sold in 2006, enabling Grazzini to start GardenGenetics in 2007. In 2003, Grazzini was honored as an Outstanding Alumnus in Penn State’s Eberly College of Science, and in 2009 as an Outstanding Alumnus in Penn State’s College of Agricultural Sciences. Grazzini’s hands-on plant breeding experience includes vegetables, culinary herbs, herbaceous perennials, flowering woody shrubs, and vegetatively propagated annuals. He has created novel polyploids in more than 80 different plant species. His seed trade experience includes helping Gary Grimes reposition and grow the former H.G. German Seed Company during the late 1980s into what is now Grimes Seeds. Grazzini holds an M.S. in horticulture/plant breeding from Purdue, and a PhD in genetics from Penn State. He currently serves on the board of directors for Discovery Space, a children’s science center in State College, PA, and the dean’s advisory board in the Eberly College of Science. He also has participated in the entrepreneurship development program in the College of Agricultural Sciences and is stewardship chair at Mt. Nittany United Methodist Church. Grazzini will present on Wednesday, March 20 from 6:00 p.m. - 9:00 p.m. in the Business Building Atrium.